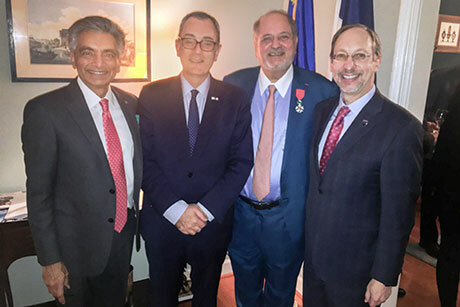 ATLANTA—The Consulate General of France in Atlanta honored Raymond Schinazi, PhD, DSc, for his receipt of the Chevalier de la Légion d’honneur -- the French Legion of Honor medal with the rank of knight. The U.S. announcement was made on Dec. 3 at a reception held at the French Residence, hosted by Louis de Corail, Consul General of France in Atlanta. The medal was presented on Oct. 15, 2018 in Paris, France. The French Legion of Honor is an order of distinction first established by Napoleon Bonaparte in 1802. It is the highest decoration bestowed in France and recognizes outstanding service to the French Republic. President of the French Republic Emmanuel Macron designates the recipients of the Legion of Honor. Foreign nationals who have served France or the ideals it upholds may receive a distinction from the Legion of Honor. American military recipients include Generals Dwight D. Eisenhower and Douglas MacArthur, and, as an institution, the United States Military Academy at West Point. Schinazi is a world-renowned leader in the field of nucleoside chemistry and antiviral drug research. He is the Frances Winship Walters Professor of Pediatrics, director of the Laboratory of Biochemical Pharmacology at Emory University, and director of the Scientific Working Group on Viral Eradication at the Emory Center for AIDS Research (CFAR). Schinazi is the co-inventor of HIV/AIDS drugs taken by 94 percent of U.S. patients on drug therapy and by thousands more globally. He is founder of five biotechnology companies focusing on antiviral drug discovery and development including Cocrystal Pharma; Pharmasset Inc. (acquired by Gilead in 2012), Idenix Pharmaceuticals (Merck in 2014), and Triangle Pharmaceuticals (acquired by Gilead in 2003). Schinazi has served on the Presidential Commission on AIDS and is the recipient of numerous awards including the Distinguished Scientist Award from the Hepatitis B Foundation, the American Liver Foundation Distinguished Scientific Achievement Award, the Pharmaceutical Research and Manufacturers of America (PhRMA) Research & Hope Award, the Middleton Award from the Department of Veterans Affairs, the Lifetime Achievement Award from the Institute of Human Virology, the Georgia Biomedical Industry Growth Award, the Scrip Lifetime Achievement Award, and the Global Hepatitis Award. He also received the Intellectual Property Legends Award and is a charter fellow of the National Academy of Inventors and was inducted into the Technology Hall of Fame of Georgia. He currently serves as a Governing Trustee for the Foundation for AIDS Research (amfAR), as a board member for the International Centre for Missing and Exploited Children (ICMEC) and as a member of the Board of Directors of the Global Virus Network.